Taxpayer cost of LePage’s stay at Trump hotel to finally be released? It's one of several public records requests that the former governor failed to fulfill before leaving office. His successor is expected to address them promptly. AUGUSTA — With Paul LePage no longer in office, the public may finally learn how much the former governor spent at President Trump’s Washington, D.C., hotel during his travels to the capital, despite what experts say are serious shortcomings in Maine’s public records law. Throughout its final 22 months in office, the governor’s office failed to comply with a public records request from the Portland Press Herald for receipts and other documentation connected with LePage’s taxpayer-funded stay at the Trump International Hotel. 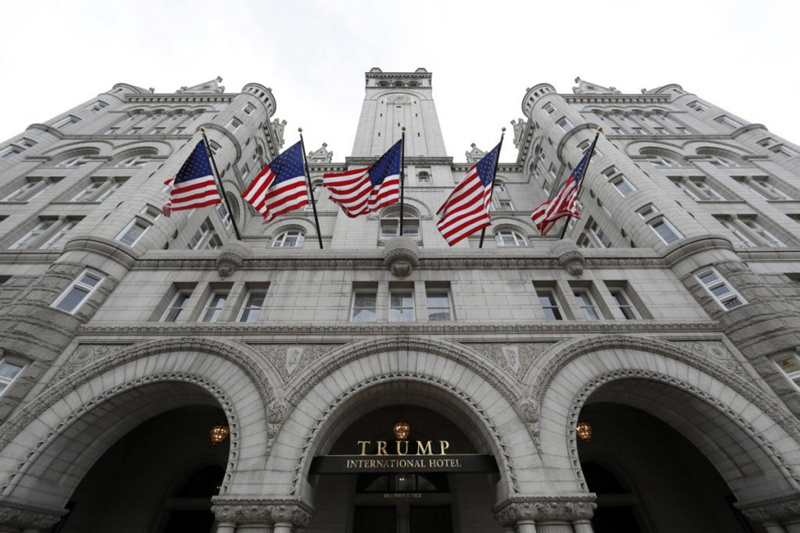 LePage’s use of the hotel has been repeatedly cited by a federal judge in connection with a lawsuit alleging Trump is violating the emoluments clause of the U.S. Constitution, which forbids a president from profiting from foreign, federal or state governments. Last month, the attorneys general of Maryland and the District of Columbia announced that they would be subpoenaing LePage in connection with the lawsuit. This fall and winter LePage’s spokeswoman, Julie Rabinowitz, repeatedly refused to say why LePage had failed to turn over the records more than 600 days after they were requested, when the Department of Public Safety had provided corresponding receipts for his security details in just 10 days. “Under the (Freedom of Access) Act, neither departments or the Office of the Governor is required to comply with the FOAA (request) in lieu of their regular workload, so some requests, particularly those that involve significant redaction or review, will take longer,” she said via email in late October. In the final days of the administration, Rabinowitz said the governor’s office would fulfill all outstanding FOAA requests before leaving office on Jan. 2, a promise that was not kept. With the change in administrations, the information will likely be released soon, as the new Democratic administration of Gov. Janet Mills now has responsibility for fulfilling the requests and has little incentive to delay release of her predecessor’s travel expense information. A spokesman for Mills said the governor would promptly address any outstanding public records requests. The state government point person tasked with resolving public records disputes, public records ombudsman Brenda Kielty of the Maine Attorney General’s Office, did not respond to multiple requests for comment over several weeks. The Trump International receipts are not the only unmet request. The other six open requests remain unfulfilled. Also in October, the governor’s office fulfilled an 8-month-old request for LePage’s records connected with chairmanship of a pro-offshore drilling coalition of governors after a reporter asked for an on-record explanation for the delay. The released records showed the coalition was staffed by an oil and gas lobbying firm. Judith Meyer, executive editor of Lewiston’s Sun Journal newspaper, who sits on the 16-member Right to Know Advisory Committee, a group created by the Legislature to make recommendations about Freedom of Access Act – or FOAA – issues, says getting public records requests fulfilled in a timely fashion is even more difficult for ordinary citizens. One problem is that Maine’s FOAA lacks any meaningful enforcement provisions. The law calls for a $500 fine to be imposed on a government agency whose employee willfully violate its provisions, but only if a state prosecutor gets a court to impose it. Another law imposes a $50 fine for intentionally altering or destroying state documents, but the provision is not believed to have ever been employed. University of Arizona journalism professor David Cuillier, a national expert on public records law, agrees that enforcement provisions are critical. He says his research found the most effective provisions are to make the government agency liable for a plaintiff’s legal fees if they win a public records suit, a feature Maine’s law lacks. “This makes agencies work a little harder at following the law,” he says. “You can have the best law in the world, but if there are no penalties, then a lot of people won’t follow it,” Cuillier says. David Heidrich, spokesman for LePage’s Department of Administrative and Financial Services – which includes the state’s information technology office – told the Press Herald that all the emails and digital documents of LePage administration officials who left state service years ago remain on the servers of the agencies where each official worked. Schutz said it would be unlawful for anyone to delete records requested by journalists or other members of the public under FOAA . “Where there is a pending public records request, it would be a violation of the law to destroy records responsive to that request,” he said. Before leaving office, LePage spokeswoman Rabinowitz said the governor’s office has been fully complying with both public record and document retention laws, and has been in the process of transferring appropriate records to the Maine State Archives. “The Governor is an avid reader of history, and he wants to ensure the archival records are complete so that future historians will be able to accurately write about this Administration and its achievements,” she said via email.